A New Season of Laughs From Gotham Comedy Club are Headed Your Way this Thursday! Grab some popcorn and a comfy spot on the couch as your favorite stoners, Cheech & Chong, take the stage on Gotham Comedy Live presented by Carl’s Jr. Hardee’s. They’re joined by four other comedians for an epic hour of TV. This week, Cheech & Chong are joined by Gary Cannon, Erica Spera, Joe DeRosa & Mike James. NEW episodes of UNCENSORED stand-up are coming to AXS TV January 19th! Here's Cheech & Chong to get you ready for the latest run featuring William Shatner, Paul Rodriguez, Pete Davidson, Fran Drescher, Frank Caliendo, and More! On today's Howard Stern Show, Howard was talking about how people approach him at parties saying Gary Dell'Abate won't allow him on the show anymore. However, we all know that Stern only does boring interviews with A-listers nowadays. Robin said the same thing happened to her at a party. Tommy Chong approached her saying Gary won't allow Cheech and Chong on the show anymore. Keep in mind that Howard Stern reunited them on his channel 9 show, back in the day (1991) and a few times since them. 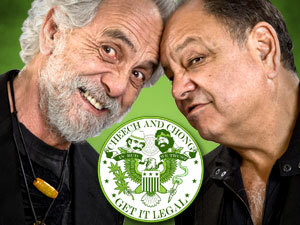 Cheech and Chong aren't a great interview and they're not A-listers.